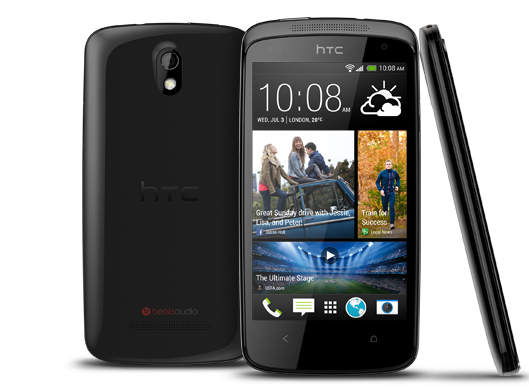 HTC Desire 500 recently was recently made available for pre-order at Rs. 999 and will be soon available in India. This phone features specifications at par with Budget Quad core devices available in India around the price range of 10,000 INR and competitive pricing will help HTC grow its user base in India. Let’s take a look at what this phone is offering in terms of specifications. The Internal storage memory of this device is 4 GB and can be further increased to 64 GB using a microSD card. Generally we see microSD storage extendable to 32 GB but this phone will provide you with ample microSD card support. This Phone is powered by Qualcomm MSM8225Q Snapdragon 200 quad core processor clocked at a frequency of 1.2 GHz. This processor is inferior to MT6589 chipset, we generally see in budget quad core devices, with regards to performance benchmark and architecture. The processor is based on Cortex A5 architecture which is old technology. The RAM capacity backing up this processor is 1 GB which is pretty standard. The chipset will perform smoothly for general purpose usage and low to moderate intensity gaming. The battery capacity of 1800 mAh will give you sufficient 12 hr of 3G talk time and 435 hrs of standby time. It should be apple to carry you through the day with moderate usage. The display of this device is 4.3 Inch in size which is quite small and sports WVGA 480 X 800 pixel resolution which amounts to a pixel density of 217 ppi which is average clarity display. This display will suffice for intended general purpose usage. Other devices from domestic manufactures like Lava Iris 504q and Videocon A55 HD will provide you with better display options at the similar price range. This device runs on Android 4.1 jelly bean operating system which will provide you with good android experience. This phone also features Dual SIM functionality. This phone bears the signature HTC look and can be rated comfortably above average in the expected price segment. This phone is 9.9 mm thick and weighs only 123 grams which makes it comfortable to hold. Connectivity features include GPRS, EDGE WiFi, Bluetooth 4.0 with A2DP and micro USB. This phone also supports USB OTG which allows you to directly connect pen drive and other peripherals to your smartphone directly with an OTG cable. This phone will compete with phones in the range of 10,000 to 15,000 INR which includes quad core devices like Micromax Canvas HD, Lava Iris 504Q, Videocon A55 HD , XOLO Q1000 and Panasonic T11. Most lower brand name phones will offer you with better display and processor in this price range. HTC has provided with a product with average specifications that brings nothing new to the table. Though actual price has not been unveiled yet and the currency fluctuation still remains a valid problem. If HTC wants to gain more acceptability in the Indian market then it will have to deliver competitive pricing, something we have not seen in earlier HTC devices in the recent times. sim size regular or min?